Sign up today for the BlueClaws Youth Baseball Camp, presented by Stop & Shop. 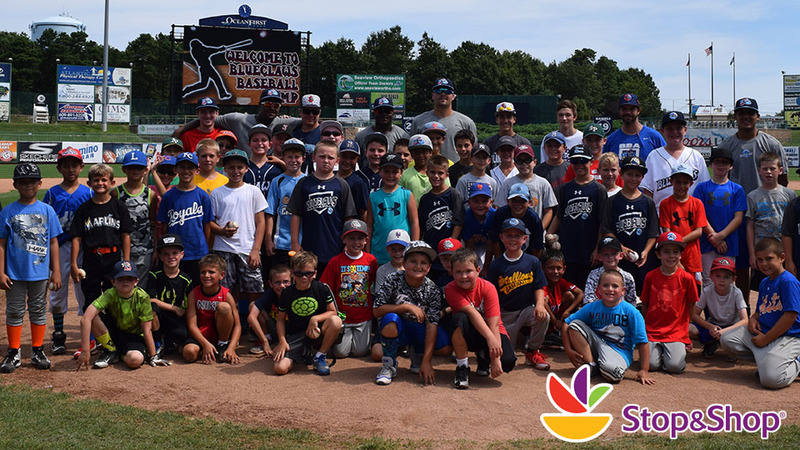 LAKEWOOD, NJ - Learn the game from BlueClaws players themselves as part of the BlueClaws Youth Baseball Camp at FirstEnergy Park, presented by Stop & Shop. The BlueClaws will hold three sessions this summer, a two-day session, a three-day session, and a four-day session. Camp each day runs from 9 am - 12 pm and includes lunch from 12 pm - 12:30 pm, an autograph session with BlueClaws players on the last day of camp, BlueClaws merchandise, and one ticket to a BlueClaws game. The camp will cover all aspects of the game, with emphasis on hitting, base running, fielding, throwing, pitching, and position work. The objective of the camp is to instill the fundamentals of baseball, promote good sportsmanship, and create an enjoyable learning atmosphere for all. BlueClaws Youth Baseball Camp sessions typically sell out and those interested are encouraged to book their spot as soon as possible. How to Sign Up: Sign up online by clicking here, or call Kevin McNellis at 732-901-7000 ext 164. The BlueClaws are the Jersey Shore's top stop for affordable, family entertainment. They have led the South Atlantic League and New Jersey in attendance in all 16 years of existence. To order tickets to any 2017 BlueClaws home game, call 732-901-7000 option 2 or click here to order online.